There is no one design that is best for every type or stage of keratoconus. The “best lens” is the one that fits your eye, corrects your vision and is comfortable to wear. Rely on an experienced keratoconus lens fitter to select the best lens for your eye. The needs of each individual is carefully weighed to find the lens that offers the best combination of visual acuity, comfort and corneal health. Contact lens fitting for keratoconus is part science and part art. A great deal of patience is required both on the part of the fitter and the patient. Not everyone is an ideal candidate for contact lenses. 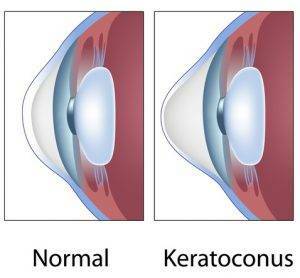 Keratoconus is a relatively uncommon eye condition where the cornea becomes thinner and bulges forward. If you have keratoconus, contact lens wear may be more difficult. But “difficult” doesn’t mean impossible. Often, people with keratoconus can wear contacts quite successfully. Today we have multiple contact lens options to address the vision needs of our keratoconic patients. Rigid Gas Permeable (RGP or GP) contact lenses – are primary option for correcting KC vision. The rigid lens masks the underlying irregular cornea and functions as the new refractive surface of the eye, with the tear film filling in the space between the back of the contact lens andthe front of the eye. “Rigid” defines the type of lens. “Gas Permeable” describes the lens material. There are many different RGP lens designs. Piggy-backs – This is a two lens system; an RGP lens worn on top of a soft lens. The RGP lens provides crisp vision and the soft lens acts as a cushion providing comfort.Hybrid lenseshybrid-contactsThis is a lens design combination that has an RGP center surrounded by a soft peripheral “skirt”. Hybrid contact can provide the crisp optics of a GP lens and wearing comfort of soft contact lenses. They are available in a wide variety of parameters to provide a fit that conforms well to the irregular shape of a keratoconic eye. Scleral lenses – These are large diameter lenses that rest on the white part of the eye, called the sclera, and vaults over the cornea. The size can be an alarming prospect for some, but scleral lenses have many advantages. Because of their size, they do not fall out and dust or dirt particles cannot get under them during wear. They are surprisingly comfortable to wear because the edges of the lens rests above and below the eye lid margins so there is no lens awareness. The introduction of rigid gas permeable (RGP) materials has made this design more readily available. Today we have multiple contact lens options to address the vision needs of our keratoconic patients. It is the responsibility of the contact lens practitioner to prescribe the most appropriate design for the individual patient.